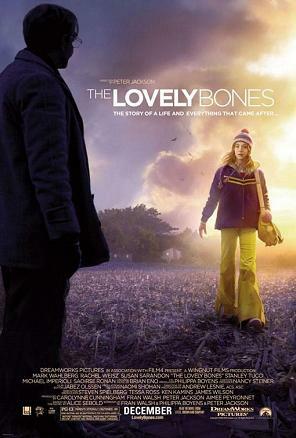 From the "movies I missed" section of my personal vault , my husband and I saw The Lovely Bones courtesy of NetFlix last night. And it has been a few years since I read Alice Sebold's stunning debut novel. I say stunning because I can't recall ever reading a book told from a fourteen year old murder victims point of view before. I remember reading these opening lines and literally gasping. Sebold, skillfully paints both Susie's world - and Susie's heaven - as seen from the eyes of a curious, intelligent, quirky budding teenager. Her ordinary fears, quirks, passions make her a typically untypical teenager and we love getting to know her. Which makes the fact that she's dead all the more painful. The fact that she has to watch over the world without herself in it is also painful and poignant. Her father's absolute grief stricken rage, her mother's burial of her emotions, her sister Lindsay's bravery. Susie, struggling to stay and punish her murderer, the "skeevie" Mr. Harvey knows too that in order to move beyond the in-between, she has to let her family go. The book was so strange because of course, nothing can undo Susie's death. We don't want her to go into that cornfield, the sight of that underground dwelling is instantly frightening to the reader. We know that only something very, very bad is going to happen. "Don't go in, don't go in, don't go in!" our hearts hammer. Oh why does she go in?! Because it's 1973 and as the book explains, this is long before kids were shown on milk cartons, this was before we know that horrible, horrible things could happen to anyone. And certainly before our children knew it too. So when Susie is beckoned by the adult - creepy as he was - she can't really contemplate refusing and so we read with mute horror. "no, no, no." Her death being a given, it can't be undone, we want the next best thing, the murderer has to punished. 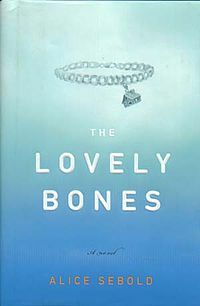 In most novels it is the finding and catching of the murderer but in this book, there is no mystery. We know who the murderer is right from the get go and it's frustrating to see the family flail while Mr. Harvey goes about his business. This book, while it begins with a murder, is ultimately not a murder mystery. It's about love, family, grief; in a word, life. In the film version, director Peter Jackson has the usual problem—what do you leave out when you turn a 328 page book into an hour and a half movie? Well he certainly didn't leave out heaven—or at least the in-between—or the notion that we all have our own heavens, some parts of which we share with others, some parts for ourselves alone. It is the in between world that is the most beautiful in Jackson's movie, as well as the most confusing, Susie's heaven, in the book, is somewhat more grounded in reality. Not that it is more realistic but it feels more solid and less ethereal. It is a high school world with no classes or teachers—just the fun stuff vs Jackson's gazebo in the middle of a cornfield that disintegrates in slow motion. The young actress that plays Susie Salmon is the amazing Saorise Ronan who is almost exactly how I pictured Susie although Jackson's version is a little less sarcastic than Sebold's Susie. Saorise went on to star in Hanna, where critics overwhelmingly gave her well deserved high marks. The film also stars Mark Wahlberg and Rachel Weisz as Susie's parents, Susan Sarandon as her alchoholic grandmother and Stanley Tucci as the super creepy Mr. Harvey. Tucci was nominated for, but did not win, Best Supporting Actor.